An Umbrella for Alex narrates a young boy's journey as he attempts to understand and cope with his mother's abrupt mood swings. 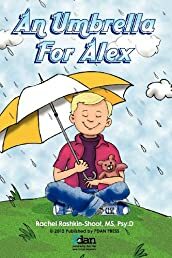 Written to be read with a therapist, parent, or other trusted adult, the story of Alex reassures affected children that they did not cause and are not responsible for the volatile behavior of their parent. Borderline Personality Disorder (BPD) is a mental illness that affects some adults, and manifests itself by abrupt mood swings and episodes of anger or desperation. It impacts family relationships, especially parenting interactions, in frightening and confusing ways. This book is suitable for both boys and girls, and the absence of the term "Borderline Personality Disorder" in it makes the book available to a wider audience, specifically those children whose mother or father has been diagnosed with Narcissistic Personality Disorder, Bipolar Disorder or other mental illness.